This small fishing village is your gateway to Costa Maya, and is the hidden jewel of the Yucatan Peninsula. Located on the beautiful turquoise Caribbean Sea it boasts secluded white powdery sand beaches. 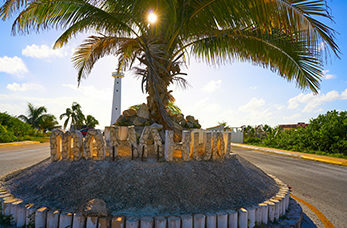 There are many wonderful attractions situated nearby to Mahahual including the historic ruins of Tulum and Coba making it an ideal place to explore these fascinating ruins. Explore the Chacchoben ruin's and discover this virtually unexcavated site which was once reserved for elaborate religious ceremonies. Spend time relaxing on the perfectly white sandy beach right off Mahahual's beautiful malecon, the crystal clear water is shallow for about 100 metres making it ideal for snorkelling. Visit one of the most beautiful Mayan ruin sites in Mexico, located on a cliffs overlooking the azure waters of the Caribbean Sea. Explore the unique Maya ruins at Coba, dating back to 600-900 A.D. this site was the heart of the many cities in the eastern Yucatan. Climb the 120 steps to the top of the Grand Pyramid for a view of the surrounding jungle.